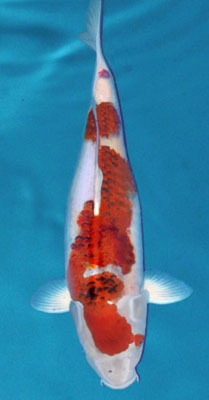 A cross between Kohaku and Asagi, Koromo has a pure-white base with Asagi-like reticulation on the red pattern. - Aigoromo: blue netting within the red scales (on a white body) but the head Hi has no reticular pattern. 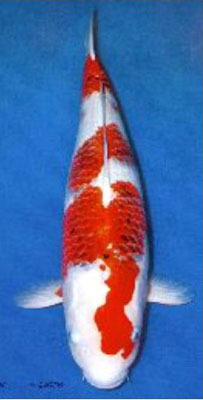 - Sumi Goromo: black netting within the red scales which can appear on the head Hi as well. - Budo Goromo: purplish netting within the red pattern. as well as the Ai of the Koromo(Koromo Sumi). - Ai Showa or Goromo Showa: a cross between Aigoromo and Showa Sanshoku. Koromo: Similar to Kohaku, but with accents of blue, black, purple mixed in with some to much of the red, due to cross-breeding with Asagi. 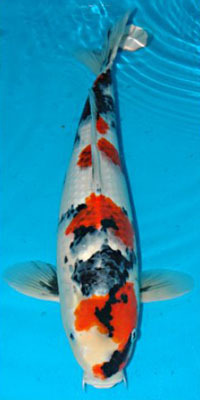 Aigoromo: White bodied koi with red pattern with scales tinged with black edges. Sumigoromo: White bodied koi with black pattern with scales tinged with red edges. Budogoromo: White bodied koi with sumigoromo pattern where colored areas resemble bunches of grapes. Koromo meaning "robed" is a cross between Kohaku and Asagi. The result is a white base koi with a red Kohaku pattern that has blue edged scales forming a reticulated pattern only on top of the red pattern. Ai Goromo has beautiful blue netting. Sumi Goromo adds sumi spots. Budo Goromo has what appears to be clusters of grapes on the red pattern. There are also crosses of Sanke and Showa with Asagi to create Koromo Sanke and Koromo Showa. Various Types of the Koromo which means "robed" in Japanese, have been developed by crossbreeding Asagi with other varieties. One of these representative types resulting from such a cross are the "Ai-goromo" which have blue bordered scales on the Hi patches, but the head Hi is completely free of blue colour. "Ai" means indigo blue in Japanese. It was bred by cross-breeding a male Kohaku with a female Asagi. The first point of appreciation is deep Hi, with a pattern like that of the Kohaku. Secondly, the area of blue-edged scales should be neatly aligned. There should be no blue on the head Hi. Some Ai- goromo have blue edges around the Hi markings, and this is undesirable. Koi with Sumi instead of Ai are called “Sumi-goromo”. In this type Sumi appears not only on the body, but on the head Hi. The “Budo (grape) Sanshoku” can on rare occasions be found among the fry of the same Kohaku X Asagi cross that produces the Ai-goromo. It is a very unique type with a violet-coloured Hi. There are Doitsu Budo Sanshoku , too. The "Hagoromo" resemble Ai-goromo with the blue over the body Hi, but the cheeks and pectoral fins are red. 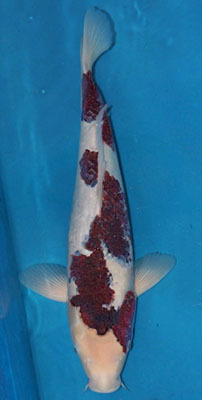 "Koromo Sanshoku" come from Ai-goromo X Taisho Sanshoku crosses, and have Hi markings with blue- bordered scales. They have the Sumi of the Taisho Sanshoku as well as the Ai of the Koromo. The former is called "Hon Sumi", and the latter "Koromo Sumi". The "Ai Showa" or "Koromo Showa" come from Ai-goromo X Showa Sanhoku crosses. They have Koromo Sumi, but the Hon Sumi, in this case, comes from the Showa Sanshoku. "Shochikubai" ( Pine-Bamboo-Plum ) are one type of Hakarimono of the Ai-goromo.